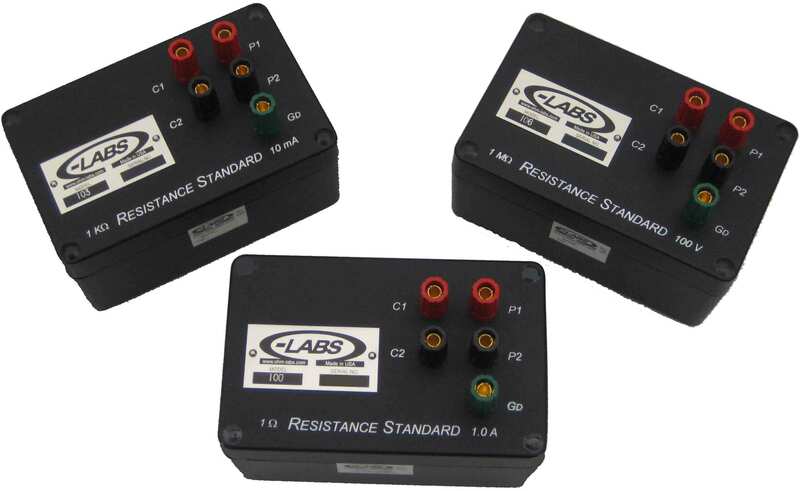 1 Ohm to 10 Meg - 100 Series- Air at 23 C | Ohm-Labs, Inc.
Ohm-Labs' 100 series standards are designed for laboratory or on-site calibration use. Their low coefficients of temperature allow them to be used in a variety of environments without loss of accuracy. They are immune from changes in barometric pressure and relative humidity, and are not affected by moderate vibration or shock. They display low reactance, allowing their use as both DC or AC standards. All models are housed in a rugged, die-cast aluminum case. Internal shock-absorbing construction reduces the possibility of shifts in value due to vibration or impact. Connections are made via gold plated tellurium copper low thermal emf binding posts, which accept bare wire, spade lugs or banana plugs. ISO17025 accredited, traceable calibration, including temperature characterization, is included. All models are available with an optional temperature sensor bonded to the resistance element. Decade and thermometry values are standard. Other resistance values are available on request. High resistance standards in this line are available in a guarded construction. Below one ohm, please see our 1000 series low resistance standards. For a complete set of this type of standard in a temperature stabilized enclosure, see our new Multiple Resistance Standard. 11.90 1.9 Ohms Stability and coefficients are similar to above models. Stated accuracy is at time of manufacture.